I have been trying to visualise what new Rudd year ten classrooms will look like: 25 laptops with their screens up, students hiding behind them, and teachers talking to what they can see — 25 machines. Today's teacher has to survive in a world of gimmickry. Students pay better attention to ringtones than to the human voice. They expect colour pictures and flashing graphics rather than pen and whiteboard. So a good teacher must learn to tap into short attention spans. In my case, an Irish accent and some quaint expressions helped, but teachers must use whatever they can. I knew some senior boys once who kept a note of the odd statements of their favourite teacher. At the end of the year they presented them to him. Did he change? Not on your life — if his class remembered his bizarre comment on a passing helicopter it was possible they might also recall his enthusiasm for Jane Austen. Good teachers need to be good actors. They must be able to do comedy as readily as drama, whispers as well as shouts; to be Jim Hacker one day and Sir Humphrey the next. Absentmindedness and even crankiness, real or feigned, can be effective so long as they are not overused. Over time the teacher will create a mystique about themselves, a set of stories to be passed on. They will let slip that they follow Essendon or South Sydney, can't stand boy bands or Kylie Minogue or Big Brother, but love pan pipes and Scottish dancing — the more uncool the better. I applaud Mr Rudd's belief that modern education has to deal with the world of ringtones and Facebook. But while the promise of a laptop for every student in their last four years of high school was politically smart, it was educationally naive. That the states would come up with a shopping list of extra money to get the scheme to work was merely the political bird predictably coming home to roost. More damaging was the impression that laptops would somehow produce better classroom results. And there is the implication that a clever machine can replace a human. As a teacher you quickly learn that you should not talk for more than five minutes at a time, possibly less in some subjects. That is all the time you can command students' attention, so you know you must get across what you want without wandering into some side street. After that, there may be questions or classroom interaction or a short period of quiet work, before the whole process is repeated. In our brave new world, you are likely to hear 'Sir, ctrl-z doesn't work' or 'do we have to use www?' It is like a mobile phone ringing in the middle of a Sunday sermon — the thread of your work and their concentration is lost to technology. One final thought. A classroom of laptops is best controlled and monitored by a technician. A classroom of year ten humans is best overseen by another human. But please don't tell Mr Rudd or we may hasten the day — already predicted — when a school of 100 teachers will be reduced to 20 teachers and 80 technicians. Frank O'Shea is a retired teacher. His book Keeping Faith: 40 Years of Marist College Canberra was published in March. Frank - I think we have to get beyond the "human vs technology" aspect of these discussions. I personally also have gone for the romanticism of human vs human interaction - but the reality is the issue is more complex and sophisticated than that. We need to recognise the two are not mutually exclusive. We need teachers willing to do what they have always done, adapt and understand enough of the changing world, to facilitate the process of learning. The internet and new media provide so many opportunities - Rudd's proposal may not be perfect, but it is at least engaging with the reality. And, why not have 100 teacher/technicians...media literacy is fundamental to the world now - yet we are letting our children down if we refuse to engage and support them to use these new tools in a way that makes for better learning, better human engagements and improved lives. The other night, my 80 year-old grandmother Skyped me from her place in Melbourne. She communicates with her grandchildren who are overseas in this way - she sees the potential of the technology - hopefully enough educationalists do as well. Change is constant. Adaptation essential. The kids will quickly learn to deal with the techno stuff. The computer will encourage a very broad access to knowledge but only a human being can bring the human loving element to the classroom. The computer is just another very powerful tool teachers have to get their heads around. By the way, a laptop won't block eye contact unless the student is lying on the desk. I agree with comments about government failure to address issues of Australia's relative decline in educational provision, and its equity in particular, by implementing regressive, politically "smart", and "educationally naive" policy. Frank O'Shea has common sense and is to the point in saying what the implications are for the classroom. He is telling it the way it is for an engaging "sage on the stage". Australian governments are planning to spend billions of dollars on a highly valued and respected but old-fashioned model of schooling, without an adequate vision for this century's schooling. Transforming schooling, by using the accelerating advances in technology, drawing upon the expanding knowledge in the social sciences rather than repudiating it for electoral purposes, and real concern for young people in their communities is needed to enable all people to face the "interesting times" ahead. Our denial of increasing inequity in education and of inequality in society is similar in kind to our denial of Earth's perils. A teacher becomes more a "guide on the side". Humanity is not lost, if we design more engaging, creative learning experiences that draw upon the world's best, and free the learner for more personal contact with their teachers. This article could only have been written by someone who loved teaching. As someone who's shared the experience of more than one or two years working with year 10 boys, I enjoyed reading these words, and support every one of them. I'd like to use this article with one of the occasional classes I take with undergraduate education students as it emphasises the humanity in the act of teaching. To engage students, with or without laptop, is the essence of teaching. A task which when accomplished leaves an indelible mark on the students concerned ... memories about content of subjects, memories about the way the world works, memories of humour and passion and joy. Teachers need intellectual rigour to engage students, need to have a wide experience of the world and its vagaries and above all to love learning. No technician or laptop can provide that human interaction available from a teacher who knows how to impart learning, who is flexible and adaptable to change and difference. We need to recruit the best possible for the profession. Computer power increases exponentially with time. This means that the cost comes down exponentially over time. This is why 15 year old computers, which work perfectly, are only worth $10 or so - you might even be lucky if you can get that for them - today you can buy a 1Gb memory for less than that. It would be possible (given a budget of many billions) to use computers to let people in kindergarten effortlessly learn how to fly helicopters, or do cooking or brain surgery. But remember that the development costs of the software would be very high. Remember that the systems schools will buy today will be totally obsolete in ten years time, and probably not worth a cent. They will also, in ten years time, be seen to be laughably inadequate. Just as we might be horrified today by many pieces of software used in education in the 1980s and 1990s. Surely what is much more important than the Orwellian "early learning" proposed for pre-schoolers, is that we talk to each other. We do not need computers for this. But by all means we could use Skype or similar so that students could talk to students in other schools and other countries. Teaching is about activity, communication and negotiation. The last is the most important, taking a a person's knowledge of the world as seen and digested, bringing new insights to that and showing the potential for training and learning about new thought schemes and views of society. Can a laptop do that? Humanity is in all our classrooms. To add value teachers have to work in, engage and understand the world we all live in. Whether we like it or not this includes ever changing, intrusive, digital technologies. 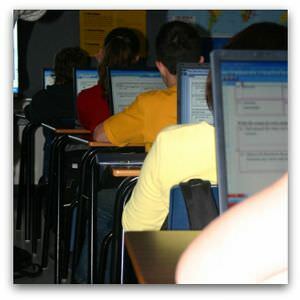 As a teacher for over 20 years I can attest that concentration spans are shorter, students (and others) are more demanding of personal attention and understanding, and that the myriad demands and opportunities that go with digital technologies is forever placing new demands on teachers, schools and education systems. There is not a day goes by when I do not see constructive interaction between students; deep, personalised learning; and approaches to using computers for learning that makes me confident our future will be in good hands. As L P Hartley wrote “The past is a foreign country: they do things differently there.” What we do not understand we can fear, or seek to understand and respond constructively. How we respond as individuals and systems will be crucial to what opportunities we can provide for a better future. Denial. Division. Engagement. Collaboration. Risk Taking. These are some of our choices. For more visit my blog. The current higher education review is hindered by a focus on 'productivity' and 'efficient investment'. Universities should be homes of knowledge whose graduates are more than just pegs to plug the holes in Australia's skills set.